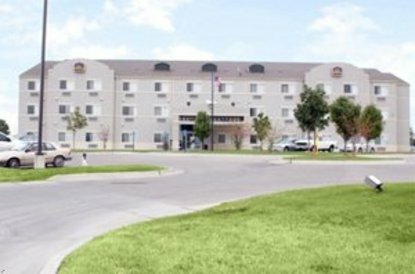 Visit this brand new hotel located on Interstate 35 in Wichita, Kansas and enjoy first class service and amenities. The Best Western Governors Inn & Suites is centrally located in Wichita, Kansas with easy access to local attractions including the Greyhound Race Track and the Kansas Aviation Museum. Guests looking for recreational activities will enjoy Watson Park, which offers hiking, boat rides and mini-golf. Stay in one of 58 spacious guest rooms or, for a treat, choose a suite with an in-room Jacuzzi. Hotel amenities include a complimentary continental breakfast, outdoor heated pool, fitness center and meeting facilities. All guest rooms feature a microwave and mini fridge for convenience. The Best Western Governors Inn & Suites is only 2 miles from the McConnell Air Force Base and 4 miles from the Lawrence-Dumont Stadium, home of the Wichita Wranglers. Families will enjoy spending the day at the Sedgwick Zoo, the Botanical Gardens or Joyland Amusement Park, all located within 8 miles of the hotel. Make an online reservation today and save at the Best Western Governors Inn & Suites in Wichita, Kansas.